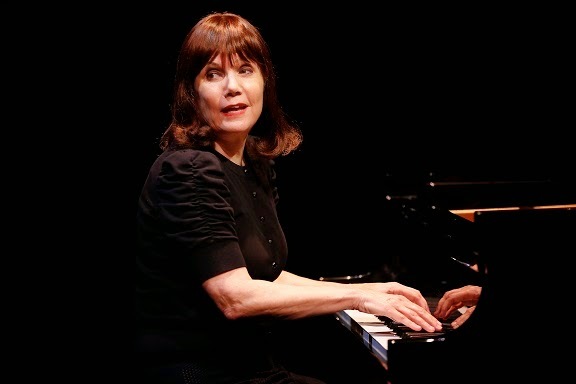 In Loving Memory: "The Pianist Of Willesden Lane"
Mona Golabek stars in “The Pianist Of Willesden Lane,” adapted (from the book The Children of Willesden Lane) and directed by Hershey Felder, which launches the inaugural 5A Season at 59E59 Theaters. Photo by Carol Rosegg. There are those memories which stir the heart and inspire. 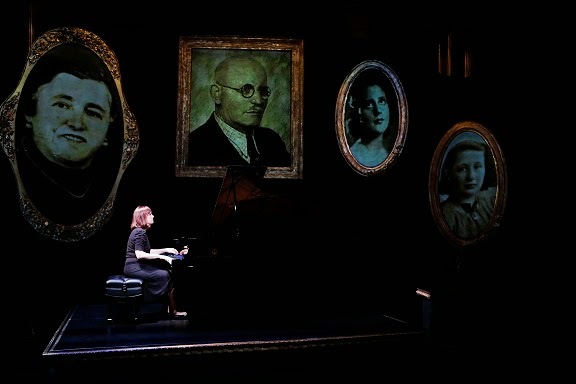 Mona Golabek shares some of hers with us in “The Pianist of Willesden Lane,” a lovely tribute to her mother, playing at 59E59 Theaters through August 24th, Lisa Jura, who survived the ravages of WWII to achieve the success she dreamt of as a young girl in Vienna. Like her mother, Mona Golabek is a musician with world-renown, whose memory play is accompanied by her performance at the piano. “The Pianist of Willesden Lane” is told in words and music, beginning with Lisa’s first encounter with the Nazis that make Vienna unsafe for her, and continuing to her concert debut in London some years later. “I had always known they were there, but I hadn’t really seen them before– ugly men with rifles, armbands– they were everywhere…,” Lisa says. She is just fourteen and her parents are able to send her to England on the Kindertransport. Lisa Jura finds her way in England, with the help of friends she makes along the way, and ends up at the London Royal Academy of Music. Mona Golabek speaks mostly as Lisa Jura and narrates in other voices, as well as, in telling Lisa’s story. Golabek deftly plays the piano pieces that weaves the backdrop to Lisa’s life. “The Pianist of Willesden Lane” is a charming, moving and inspiring tale, beautifully-wrought and elegantly presented, based on Mona Golabek’s memoir, written with Lee Cohen, and adapted for the stage by Hershey Felder, who also directs. The staging, with scenic design by Trevor Hay and Hershey Felder, is very affecting as well. The production originated at Los Angeles’ Geffen Playhouse, and is the first play staged as part of 59E59’s new Series 5A. To learn more about “The Pianist of Willesden Lane,” please visit www.59e59.org. I love the short-form play. Like condensed milk, it’s made a little richer and sweeter for the concentration. Its flavor is similar to but different from the original, of course, but more potent and easier to whip into a frenzy of thoughts and ideas. The challenge for the playwrights is, as always, to make their point fresh and cogent in a brief time. These are mini one acts! Much to the amusement of his best friend, a young man dives into one of America’s mesa strewn deserts in search of the perfect site for a wedding. With such formidable opponents as hypocrisy, government, hysteria, neurosis, family, religion and pop culture – can we ever really know and accept who we are? Well, these two brave nuns are going to give it a go! Corey is 25, living at home, can’t hold a job, and is obsessed with Minecraft. His mother has other ideas for him. Catch them at 59E59 Theaters now. And come back to this space for our commentary.